Previously we’ve written about two major problems facing healthcare consumers: lack of access, and high costs. In this post we’ll highlight another problem causing the global healthcare crisis: intermediary barriers. Unnecessary intermediation of third parties in the healthcare system, such as by insurance, brokers and regulators, can provide a material barrier to access, with physicians and patient advocates calling it “a ‘crisis’ of unprecedented interference blocking doctors from being able to prescribe the treatments they believe are best for their patients.” These include things like “fail first” policies, which require patients to try older or cheaper treatments and only approving new or cutting-edge methods once those fail. This delays what may be the best treatment for patients, and ties doctors’ hands on what they prescribe. 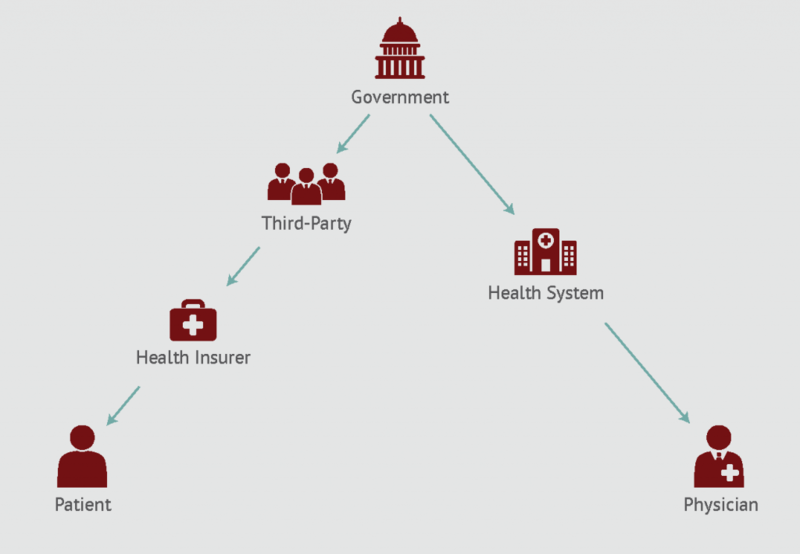 The need to obtain healthcare via or with the approval of an intermediary can create massive inefficiency that frustrates patients and providers. Most medical offices now have a full-time staff member whose entire job it is to work with health insurance companies to get approval for the recommended treatment plan. Often an entire extra person or two are required to get payment once service has been rendered. Calling multiple times before someone gets back to them is common. Meanwhile, the patient and the practice suffers. The time and costs related to healthcare billing are astronomical. Patients sometimes take time off work to navigate the paperwork and bills related to an unexpected hospital stay. There is also a healthcare legacy system dilemma of sharing versus protecting data. The current healthcare system has made it very difficult for patients to access their own Electronic Medical Records (EMRs), sometimes even being denied the ability to view them completely. EMRs are currently stored in legacy systems that operate in silos, mainly created post-WWII and pre-internet with the purpose of protecting data rather than sharing it. They are inadequate and woefully out of date. This hinders patients and most providers accessing this data, which is critical to patient care. We at HealthSapiens have created a model that eliminates intermediaries by allowing patients to pay HealthSapiens a flat fee per month for unlimited access to medical consultations. Our direct patient-to-physician network means patients can collaborate on their health without interference from a third party, allowing them to be more in control. If more medical institutions adapt a subscription model, we can eliminate third parties who slow down the process. Doctors and patients can decide what treatment to pursue without interference of an intermediary. Additionally, HealthSapiens stores patient-provided EMRs in a safe and compliant way so patients can access their records whenever and wherever they want. It is still difficult for patients to access their own medical records, which is a barrier to quality care. We propose building an enterprise system on a blockchain that is secure and easy to access for storing EMRs. The blockchain acts as an immutable record which isn’t owned by a third party, thus giving patients more autonomy in their care. To find out more about the future of HealthSapiens 2.0 (powered by blockchain technology) please visit our website and sign up for email alerts. Karim Babay is Chairman & CEO of HealthSapiens, a nationwide healthcare provider that delivers on-demand access to healthcare anytime, anywhere, via mobile devices, the internet, video and phone. Mr. Babay is also the founder and Chief Investment Officer of Intrinsic Value Investment Partners, a value-focused hedge fund. Mr. Babay has over 15 years of global investing, entrepreneurial and corporate finance experience allocating capital across the capital structure (credit and equity), angel investing, liquid and illiquid investments in securities. Mr. Babay has published numerous studies and analysis while at Columbia University. Mr. Babay is member of the board of directors and Chairman of the compensation committee of GLYECO, a publicly traded company, principally involved in processing of waste into high quality ethylene glycol. Mr. Babay received a B.S. in finance and economics from HEC Institute and an MBA from Columbia Graduate School of Business.